When I was very young, 12 or 13 maybe, I acquired a paperback of H.G.Wells’ History of the World. I probably bought it at a jumble sale but I may have just found it left on a train. It remains the only book which having read, I instantly went back to the first page and read it again. I think my interest in history dates from reading this book. It is really well written and is a gripping read. It whizzes through the entire history of the world starting with the formation of the planet itself and skipping deftly through geological time before ramping its way through ancient, medieval history and on to the present day. The pace gets increasingly breathless as we approach the modern age. I think it is about 200 pages in all if that. There is a big debate in history about whether the emphasis should be on the great men and big deeds of individuals, or in teasing out the fundamental forces behind what is happening. Are there underlying patterns that the events conform to? Or is history made by the strength of will of particular individuals? Wells was either unaware of this debate or reckless of it. He just tells the story. If a trend or a technological development catches his eye, he describes it. If he comes across an interesting character, we get their story. The two that have stuck in my mind in all the years since I read the book are King Asoka of India and Frederick Stupor Mundi, the astonishing Holy Roman Emperor. He also takes a lot of interest in the difference between the aryans and the semites. He manages to avoid doing this in a way that is anti-semitic – but the amount of attention given to it does come across strangely and a bit creepy. This book came to mind reading Niall Ferguson’s moan in today’s Guardian about the teaching of history. Most of what he says doesn’t really stand up to scrutiny. History teaching may not be perfect today, but it was dismal in the past. I used to read history text books for fun as a kid but the idea of actually studying it formally was made to seem horrific by the way it was taught in school. What he describes in a tone more suitable to the Monty Python four Yorkshiremen sketch than a serious bit of analysis sounded a lot more interesting than what I had served up to me when I was at school in the seventies. But nonetheless, I do think that Ferguson does have one good point. He complains that students nowadays are given a Smorgasbord of disconnected topics without seeing the overall arc of history. This seems like a valid criticism – though when I was at school you could make exactly the same complaint. For some reason the curriculum I happened to follow went from the Stone Age to the end of Roman Britain, then leaped to the Tudors. I am still very hazy on the Middle Ages compared to the other eras. What is needed is a simple well written book, no more than 300 pages and possibly even shorter, that does what Wells book does, just tells the story of how we got here in a compelling way. What should this book cover? It should begin with scientific theories of how the planet formed. Science and history are’t really different things. They both tell us about the world we live in. It should cover evolution. At the end of the days we are the products of evolution after all. You could easily fill the first third of the book and only get to the emergence of homo sapiens. Then go through the origin of the various civilisations that have existed and still exist. Don’t ignore non-Western ones, but celebrate the West appropriately as the most successful one to date. And above all, include the stories of individuals. Kings, scientists, musicians, playwrights and merchants have all left their mark. And we are all interested in people. The big thing is to make sure it reads well as a story. 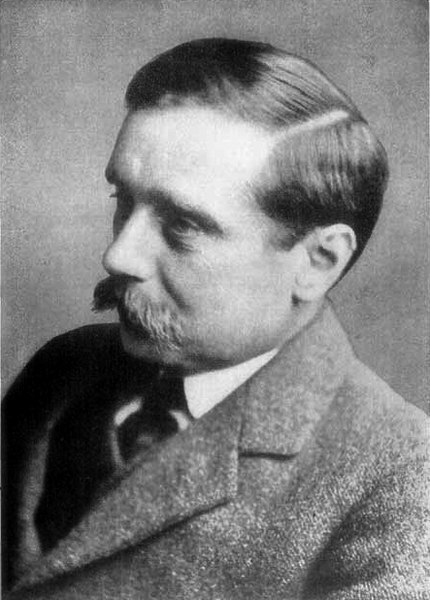 H.G.Wells understood that instinctively as a master story teller. Get the story right and everything else should fall into place. In the Guardian, Ferguson complains that a lot of history undergraduates don’t know who the British general at Waterloo was. You wouldn’t forget that if you had an idea of the drama surrounding that particular day. If there is indeed a core of key facts, dates and people that everyone should know it must be possible to get it all down in a readable form that will be very memorable. Who should write such a book? I can’t think of many people who could do a better job than Dr Ferguson himself. Read the original whinge by Niall Ferguson here. If you have any better suggestions for improving history education feel free to add a comment. While I think it is great if kids can be given some brief, broad chronological framework onto which to hook the topics they are taught in-depth, I think there are huge problems with teaching “the narrative” as Ferguson and you suggest. Which narrative should be chosen? The story of the successive rise and fall of civilisations which we have received from earlier historians does not stand up to scrutiny and it completely ignores what happens to parts of the world when they do not happen to be top dog. Even if we stuck with British history, there just would not be space to cover the whole narrative in the kind of depth required to learn anything about how things actually happened, the range of people effected, how historical research is done and how to read histories and sources critically. I would ask: what, actually, is the benefit to individuals or society if pupils leave school with a basic idea of “the narrative”? I can only imagine that it is supposed to make them see the world and their nation in a particular, and inevitably distorted, way. On the other hand, I can see all sorts of benefits to individuals, employers and society if pupils are taught skills in analysing sources and come to understand that history can be written in different ways to different ends. This can only be done by studying particular topics in depth. I would much rather children were equipped in this way than that they should come out of school thinking that there is one, straightforward narrative in history. I am pretty sympathetic to what you are saying Becky, there certainly are problems with selection once you get to recorded history. I am guessing that would be about chapter six or seven. But lots of things are difficult and yet can still be done. And although I have read about 200 books about history I am still amazed at my ignorance. How many Chinese emperors can you name? I can't name any. Not one. I think an overall guide to what happened would be a useful thing. Nobody would bat an eyelid about one for chemistry for instance. Oh that Vestiges book looks like interesting. Yes I agree about reading Wikipedia critically, but that doesn't stop books being useful as well. Charles Dickens' “A Child's History of England” seems to do the job pretty well, if I recall, although its chief deficit is the 150 or so years after the book ends during which the author has stubbornly insisted on being dead, as though this were a valid excuse not to produce a second volume!